We’re all familiar with the stellar start to 2013 experienced by equity markets. Most developed markets are up between 5 and 6% during January. The VIX index fell to 5 year lows of 12.5 by the end of January (while VIX traded volumes broke new records). Also, many other indicators of key financial stress such as the spread between borrowing rates of different maturity and security, reached the same benign levels that were at in early 2007 – as highlighted in a previous post. 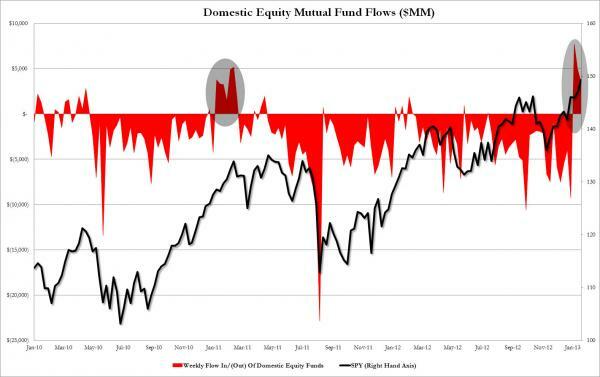 Plenty of commentators have highlighted the large inflows to US mutual funds, infact the week of 9 January saw the second largest level of inflows to mutual funds ever at $22bn. That is changing on the margin. The returns of cash are terrible. So as a result of that, what we have is a lot of money in a place — and it needed to go there to make up for the contraction in credit — but a lot of money that is getting a very bad return. That, in this particular year, in my opinion, will shift. And the complexion of the world will change as that money goes from cash into other things. As sensible as all these arguments may seem, are they really true ? And haven’t we heard them many times before ? That’s the view taken by Tyler Durden of Zero Hedge in this piece. Durden highlights a number of similarities between the situation in early-mid 2011, and now. BAML even coined the term The Great Rotation back then as flows into mutual funds turned positive for the first time in years. 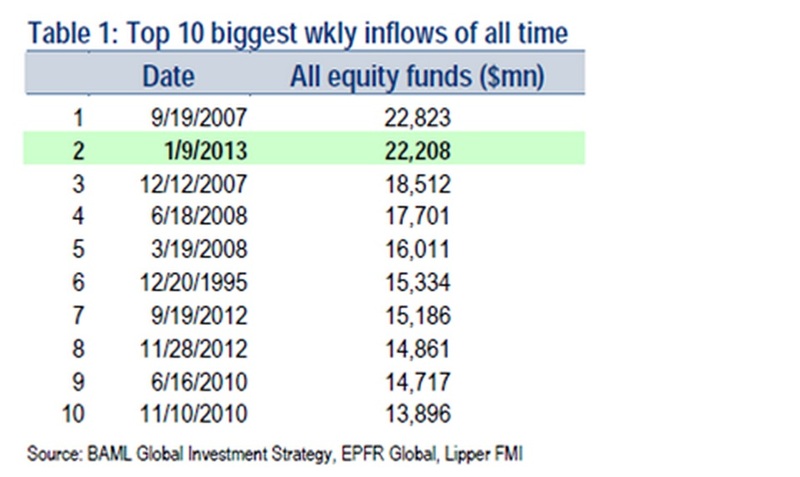 Inflows to US mutual funds over time. Although equity markets now are substantially higher than they were back at the start of 2011, its not been without volatility, in particular a period in August-September 2011 when volatility surged to the highest levels since shortly after the Lehman collapse. So the claims of a paradigm shift in markets in early 2011 seem with hindsight quite misplaced. Will the same be said of the January 2013 claims of the The Great Rotation ? The Arithmetic of Option Pricing : What price a money-safe guarantee for pensions ?